Over time, it’s very common for some of the teeth to become decayed or chipped/cracked, but without professional treatment, these small problems can easily develop into much bigger issues. Fortunately, our team at Woodside Dental Care can make pretty much any tooth look and feel like new again despite whatever issue it might have. Using the latest techniques and highest quality materials, we can fully restore your smile and confidence at the same time at our dental office serving Assonet and Freetown. To learn more about our restorative options and schedule an appointment, contact us today. Why Choose Woodside Dental Care for Restorative Dentistry? Same-day treatment available: Dr. Cornetta found a cavity during your routine examination? We’ll taken care of that same-day if you’d like! Unfortunately, your teeth can’t heal themselves like other parts of your body, so once the enamel has become decayed or damaged, it will just stay that way, and likely get worse over time. This can lead to more pain, dysfunction, and appearance concerns. 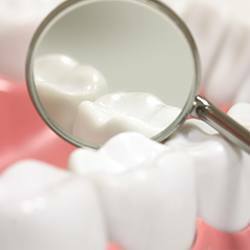 Eventually, a severely damaged tooth will either fall out or need to be removed. However, this kind of progression can easily be stopped with professional care and high-quality restorations, which is exactly what we provide here at Woodside Dental Care. A dental crown is designed to fit on top of, or “cap”, a damaged tooth to protect the remaining natural structure and bring back its original appearance, strength, and function. Crowns can be used to repair large cavities, fix broken and chipped teeth, cosmetically improve unsightly teeth, and even replace a missing tooth when paired with a dental implant. Dr. Cornetta individually designs every crown for each patient to ensure that it blends seamlessly into the smile and can be trusted to last for years. If you have a small cavity, rather than repairing it with a dark gray amalgam (mercury) filling, we now have a much more esthetically-friendly option. 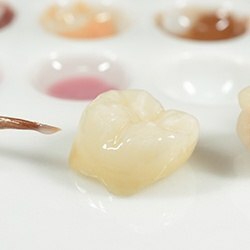 Tooth-colored, “composite”, fillings are made of a composite resin, and they can be shaded to match natural tooth structure so they can blend with your smile. This material also enables Dr. Cornetta to place smaller and more conservative fillings, helping us better preserve the natural strength of a tooth.